The Venezuelan authorities said on Sunday they have detained six suspects over drone explosions at a rally led by the Venezuelan President Nicolas Maduro. 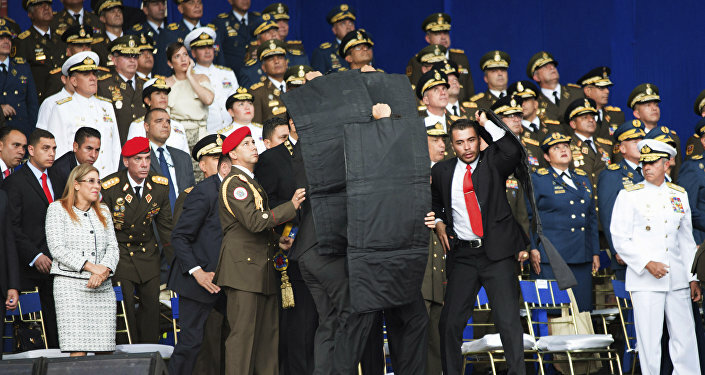 On Saturday, a blast occurred during Maduro’s address at a military parade in Caracas. Venezuela’s Information Minister Jorge Rodriguez said after the incident that Maduro had survived an assassination attempt with the use of explosive drones. The president was unharmed but seven soldiers were injured in the incident. According to the Venezuelan National Journalists Union, more than 10 media employees have been detained by local authorities following the failed assassination attempt on Maduro. The watchdog union stressed that among detainees were also foreign journalists representing Argentina and Spain as well as one employee of Agence France Press (AFP), among others. "11 journalists and media professionals have been illegally detained, some of them were beaten, while others were robbed. We express protest against it and urge to punish those responsible for violation of the right for information," the union wrote on Twitter. The president himself accused the Venezuelan opposition and Colombia of having a role in the failed assassination attempt, adding that some of the perpetrators were residing in the United States. Both Bogota and Washington denied these accusations, while the Venezuelan group Flannel Soldiers claimed the responsibility for the incident. However, The Venezuelan officials have not commented on this statement yet. Meanwhile, local media suggested that the drones might have been released from an apartment, located near the parade site, after it had caught fire caused by an explosion of one of the unmanned aerial vehicles. At the same time, several media outlets reported that the explosion may have been an accident that was caused by a gas cylinder explosion and did not target the president. Jorge Rodriguez told Sputnik earlier in the day, that the attackers behind the assassination attempt against Maduro had been preparing the operation for at least six months. What Do We Know So Far About Alleged Maduro Assassination Attempt?